When Sean Shoppell looked around the basement of Tapp’s Arts Center on Main Street, he didn’t see just an unused corner. He saw the potential for a concert venue and a public darkroom for film photographers. A year later, the small space with concrete floors, dance hall lighting and a mirror on one wall scrawled with positive sayings like “I want to get healthy” and “I will wear my best clothes” is the Space Hall of Columbia. “I was at a local show and I was thinking, and I was like the term ‘Space Hall’ sounds cool. I was wondering what that was going to be, and now it’s this,” says Shoppell, looking around the new subterranean venue that officially became part of Tapp’s Studio 31 in March. The dark, cavern-like environment of the Space Hall of Columbia at Tapp’s Arts Center combines with psychedelic signage and colorful lights to give the venue an otherworldly feel. 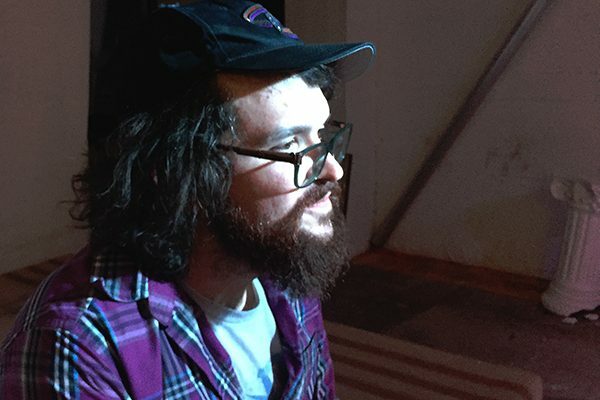 Shoppell, 25, wasn’t yet an employee of Tapp’s when he saw the space in the gallery and dreamed up the Space Hall, but he joined the Tapp’s staff as an administrative assistant in 2017 and soon was acting as director of the new venue as well. Zoe Hedquist, who manages the darkroom, said the Space Hall can adapt to however it is being used. “It’s literally just an empty room, but when artists work together to create something in there, it becomes a different space each time,” she said. Since its opening, Space Hall events have included a series of dance parties called the Bassment with local DJ Platonic Bae, the Garnet & Black spring 2018 magazine launch party and over a dozen different bands and artists for this year’s Indie Grits Festival. The shows have a do-it-yourself feel, and Shoppell wears a number of different hats during events. Keep up with different events that the Space Hall is hosting on their Facebook page. Find out on its website what Tapp’s Arts Center, one of Columbia’s top spots for arts exhibitions and gallery space, has to offer besides the Space Hall. Read WUSC’s blog coverage of the Space Hall and interview with Shoppell. So you described the Space Hall to me as an “artistic experiment,” that’s your short, bare-bones definition. So would you mind elaborating on that and sort of talking about some of the different shows and such that you’ve had so far at the Space Hall? When I say that the Space Hall is an arts experiment, it’s kind of like a catch-all and really easy to explain it that way. And it was kind of like a joke at first when someone asked me like “What’s your tagline?” or whatever it is for branding and marketing and all that. And so I kind of said it like as a joke because it sounds artsy and it sounds like really deep. And it kind of also comes from like an inspiration that there’s a very strong mesh between arts and science and everyone always puts arts and science together, but what does that actually mean and why would you say that? 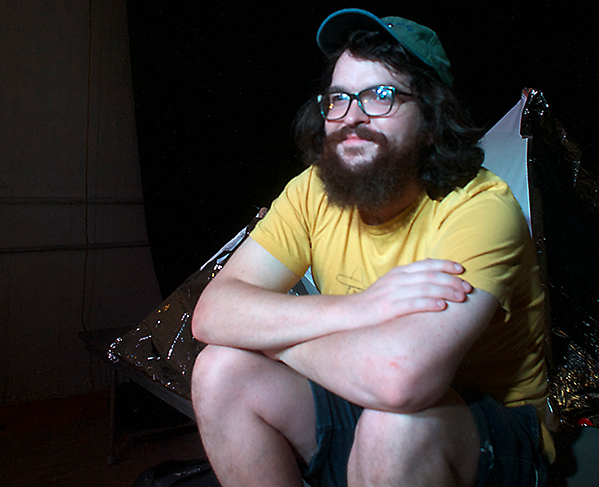 The Space Hall of Columbia’s director, Sean Shoppell, managed house shows as a college student. Now, he performs similar duties in his new venue such as manning the lights. So what do you think is present in your personality that enables you to be a good director for a venue? What do you think your biggest strengths are? It’s weird to just say communication might be a thing. I’m not good at communication, but there are certain things that I am good with where it’s like, day of a show, I know how to talk to people to get them together to do the right things. The Space Hall of Columbia is advertised largely through word-of-mouth around Columbia. Director Sean Shoppell distributes bumper stickers and buttons for publicity and maintains active Instagram and Facebook pages for the space. Has there been any moment when you’ve been at the Space Hall and you’ve been like “Wow, my dream has become a reality?” Has there been any memory that really sticks out for you?